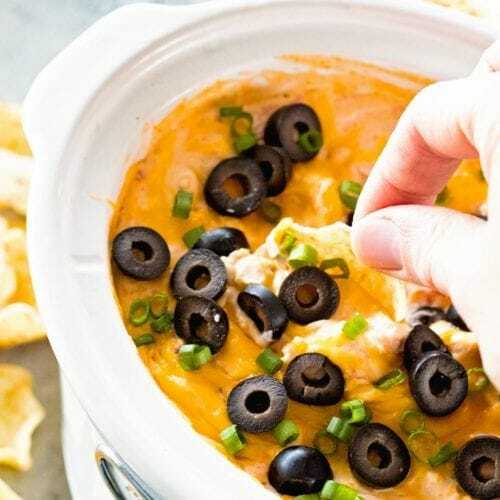 Crock Pot Chicken Enchilada Dip ~ This Easy Slow Cooker Chicken Enchilada Dip is so Cheesy and Amazing! 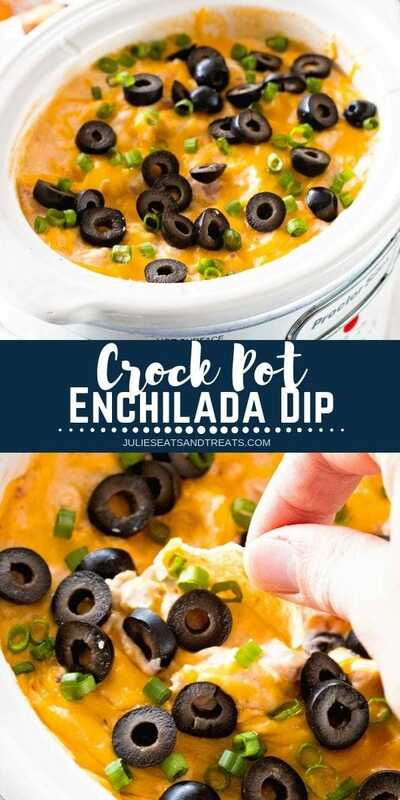 The Perfect Easy Dip Appetizer for Your Parties! The holidays are quickly come up. I can’t quite believe it and I think it’s due to the fact we don’t have any snow on the ground! While you may be all about making Christmas cookies, and I do love a good Christmas cookie, I’m all about the appetizers this time of year. 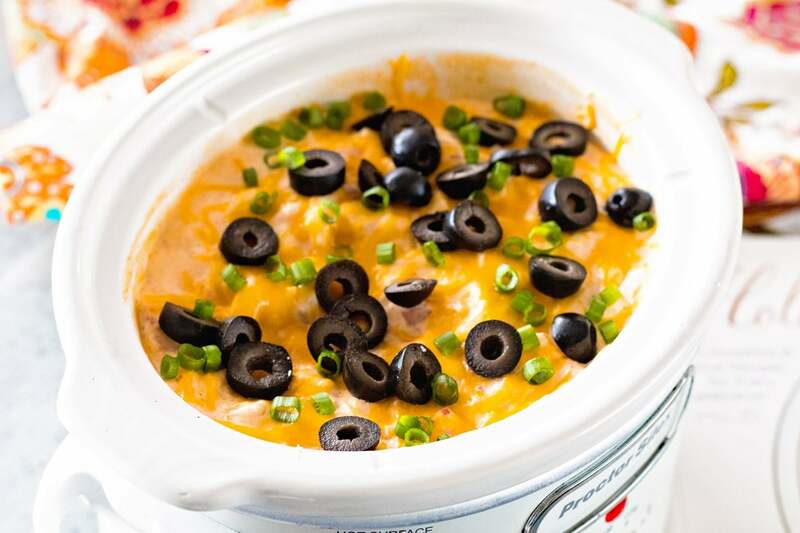 This delicious Crock Pot Chicken Enchilada Dip does not disappoint! 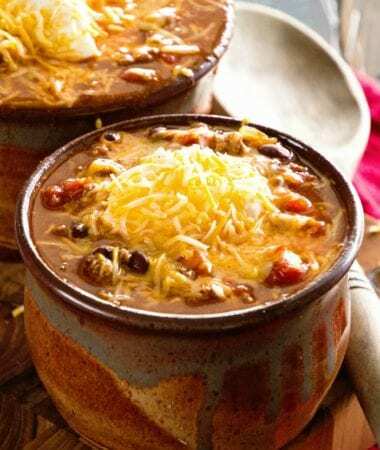 It’s cheesy, full of chicken, enchilada sauce, green chiles, cream cheese and more! Grab some chips and get ready to dip, head first if you are me! I love family events that make the meal appetizers! Have you had one of those before? It’s my favorite type of meal. 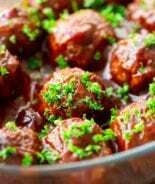 Give me some BBQ Meatballs, Crock Pot Ranch Mushrooms, Easy Taco Dip and I’m set for the evening! 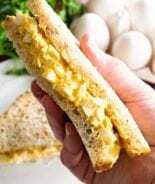 If you don’t think a meal of appetizers will hold you over we usually serve soup or sandwiches with it. Something nice and easy, stress free is the way to go! The holidays are stressful enough without adding more stress trying to plan the perfect holiday meal. That’s why I love this easy route of planning. I think appetizers are kind of overlooked. They don’t get the attention that they should because there are so many different options and I think they are all delicious! You know what else makes the holidays a bit easier? Using your Crock Pot that’s what! 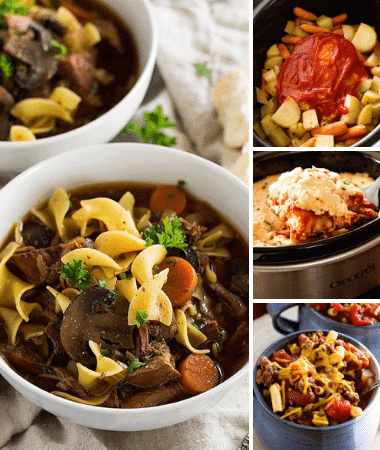 This is why I love the new Holiday Slow Cooker Recipe Book from Leigh Anne Wilkes, from Your Homebased Mom. She is speaking my love language. 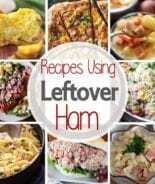 I always run out of oven space when I’m hosting a holiday, so I love using my slow cooker to free up oven space. I also love it because I can put it in ahead of time and it’s cooks while I get the final touches done. You know, all that last minute prep work you’d rather ignore! 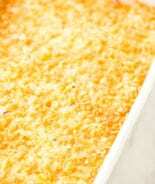 This Crock Pot Chicken Enchilada Dip is so easy to make too. If you have rotisserie chicken you could totally use that instead of shredding your own chicken that’s been seasoned with taco seasoning. I would just stir the taco seasoning into the cream cheese mixture. That would make this recipe even easier! 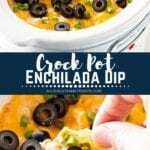 Once you plan your holiday appetizer party make sure to put this Crock Pot Chicken Enchilada Dip on the menu! 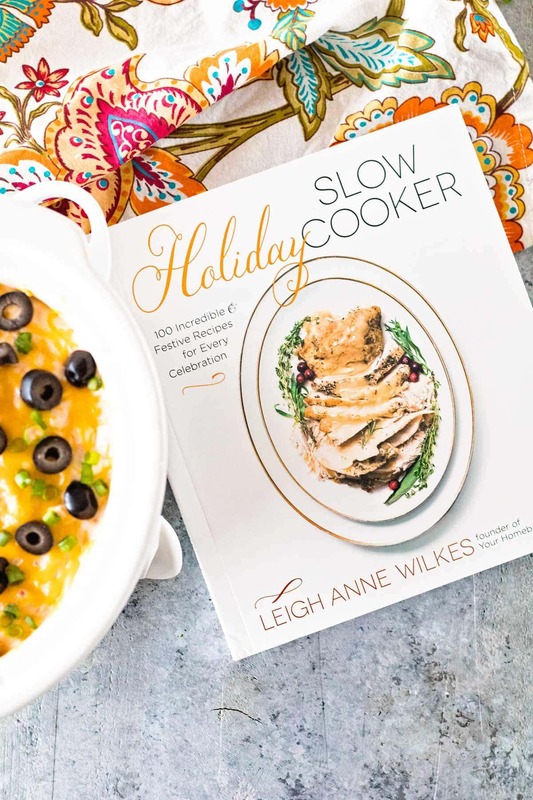 If you are looking even more delicious slow cooker recipes make sure to grab the Holiday Slow Cooker Recipe Book from Leigh Anne Wilkes. You won’t be disappointed. 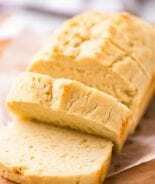 Leigh Anne is a wizard in the kitchen and makes so many easy, delicious recipes. Just like I do! 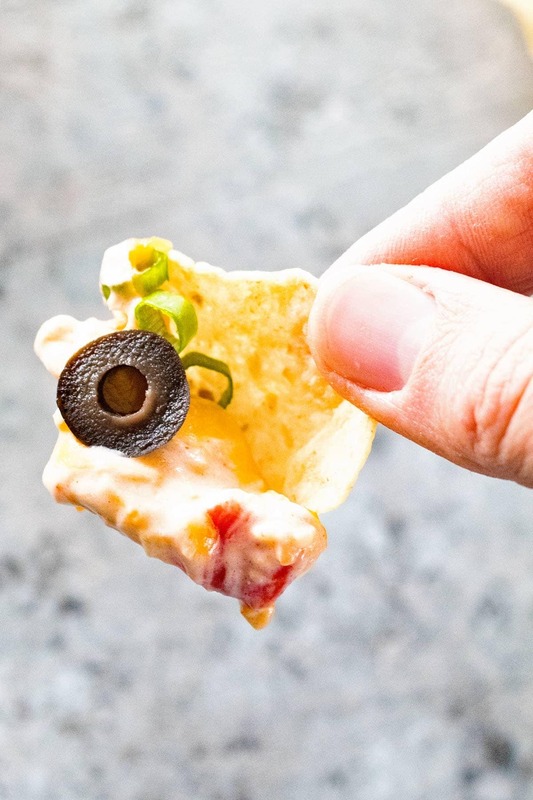 Now all you have to do is grab the chips and get dipping. Or a spoon. No judging here! Try it and love it? Rate it, please!!! 😋Seriously though a five-star rating below will make my day! 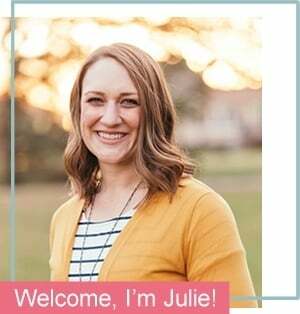 If you snap a photo, please be sure tag me on Instagram at @julieseatsandtreats or #julieseatsandtreats so I can see your yummy meal!!! Do you mix the chicken in with the other ingredients? Ha… that would make two of us! Yes, I love parties where the meal is made of appetizers!! So fun!! Me too! Can’t pass it up! 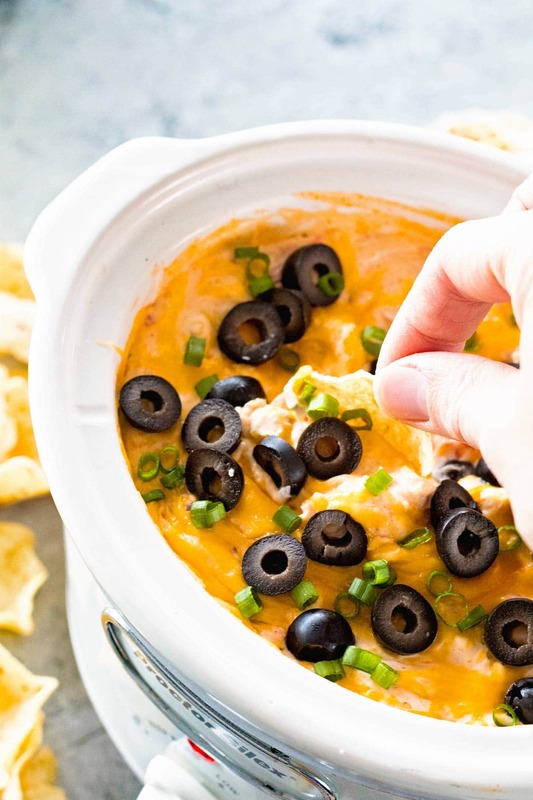 I love, love, love a good slow cooker dip, especially for a holiday party! And I have a feeling our friends and family are going to DIG this for an upcoming bowl game! Me too! Hand over the chips! Perfect game-day party appetizer or a lazy afternoon at home with family!